Question were asked about a number of risks, including nuclear war, pandemics, biological weapons, climate change and environmental collapse. 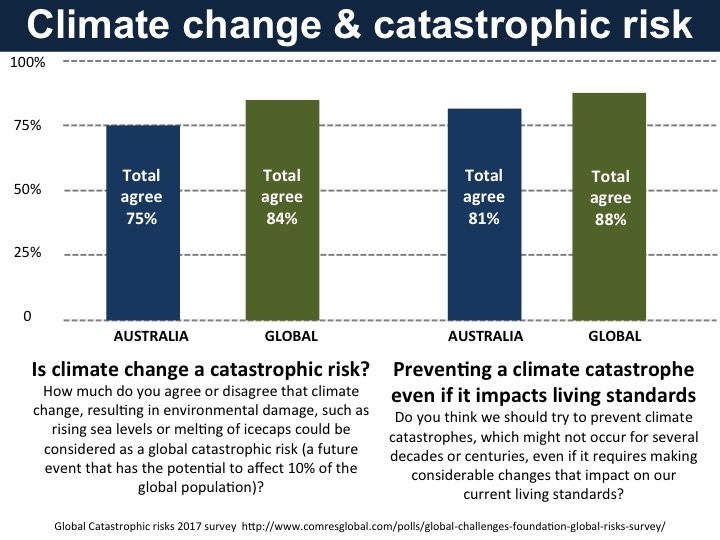 The climate question asked how much participants agreed or disagreed that “climate change, resulting in environmental damage, such as rising sea levels or melting of icecaps” could be considered as "a global catastrophic risk”? A global catastrophic risk was described as “a future event that has the potential to affect 10% of the global population”. For Australia, the results were: 39% “strongly agree” and 36% “tend to agree” (for total agree of 75%); with “tend to disagree” at 15%, “strongly disagree” at 6% and 4% “don’t know”. 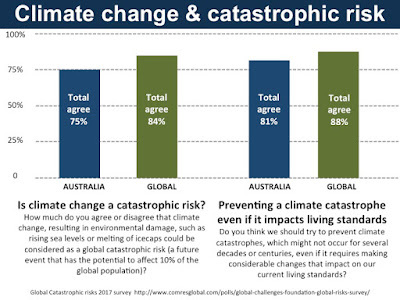 Discussions of climate change usually focus on limiting temperature rises to 1-3˚C above pre-industrial levels. A rise of 3ºC would have major impacts, with most of Bangladesh and Florida under water, major coastal cities – Shanghai, Lagos, Mumbai - swamped, and potentially large flows of climate refugees. While the 2015 Paris Agreement on climate change sought to keep global temperature rises below a threshold of 1.5–2ºC, national pledges have fallen short and set the world on a 3.6°C temperature rise track. There is also now scientific consensus that, when warming rises above a certain level, self-reinforcing feedback loops are likely to set in, triggered by the pushing of the Earth’s systems – ocean circulation, permafrost, ice sheets, rainforests and atmospheric circulation – across certain tipping points. The latest science shows that tipping points with potential to cause catastrophic climate change could be triggered at 2ºC global warming. These include the risk of losing all coral reef systems on Earth and irreversible melting of inland glaciers, Arctic sea ice and potentially the Greenland ice sheet. As well as the immediate risk to human societies, the fear is that crossing these tipping points would have major impacts on the pace of global warming itself. Although climate change action has now become part of mainstream economic and social strategies, too little emphasis is put on the risk of catastrophic climate change. This shows a stronger level of support than several other polls for action that may impact on future living standards and have a personal material cost. This strong expression may, in part, be due to the framing of climate as a potentially catastrophic risk. The GCF report found that many people now see climate change as a bigger threat than other issues such as epidemics, population growth, use of weapons of mass destruction and the rise of artificial intelligence threats. GCF vice-president Mats Andersson says "there's certainly a huge gap between what people expect from politicians and what politicians are doing". We have reached a level of scientific knowledge that allows us to develop an enlightened relationship to risks of catastrophic magnitude. Not only can we foresee many of the challenges ahead, but we are in a position to identify what needs to be done in order to mitigate or even eliminate some of those risks. Our enlightened status, however, also requires that we consider our own role in creating those risks, and collectively commit to reducing them. However, "the institutions we rely on to ensure peace, security, development and environmental integrity are woefully inadequate for the scale of the challenges at hand". Australia’s biggest corporations are no better. The S&P/ASX All Australian 50 has the “highest embedded carbon” of any group in the S&P Global 1200, according to the S&P Dow Jones Carbon Scorecard report, which assesses global companies’ carbon footprint, fossil fuel reserve emissions, coal revenue exposure, energy transition and green-brown revenue strain. At the 2017 Santos annual general meeting, chairman Peter Coates asserted that it is "sensible" and “consistent with good value” to assume for planning purposes a 4°C-warmer world.